A vehicle just fell from the top of a bridge around the trade fair complex in Badagry area of Lagos State Nigeria. The black car pictured above was returning from the international Trade Fair complex when it fell off the bridge on Badagry expressway this afternoon. 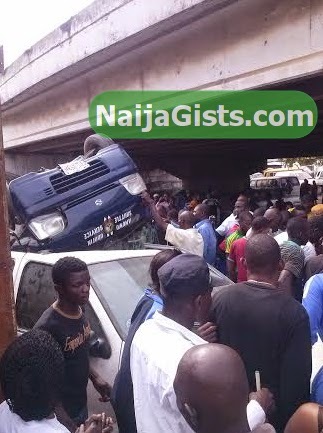 An eyewitness and a fan of NaijaGists.com, Emmanuel Nwasah who sent the picture to us said nobody died in the accident. The source said the driver of the vehicle wept bitterly because of the expensive goods that got damaged in the accident. Why is he crying, he need to thank god for is live.